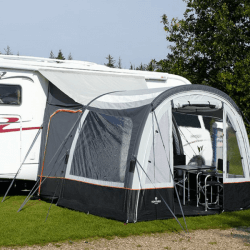 480HDE Double Rip Stop Fabric – The Optimum Strength to Weight Ratio of Any Awning Fabric, Preventing Accidental Damage from Worsening. 6,000mm² Hydrostatic Head & Fully Taped Seams Throughout – Exceptionally Waterproof; Water Will Simply Bead Onto the Surface and Roll Off. Inflatable Twin Tube Oxygen Air Frame System – Easy to Erect Multiple Inflation Point Airbeam Frame to Ensure Fast Pitching. Dynamic Speed Valve – The Quickest, Simplest and Most Reliable Inflation Valve on the Market. Intelligent Frame Relief Valve – Our Exclusive Pressure Relief Valve Preventing Overinflation, Expelling Any Excess Air Above 6PSI. Lifetime Guarantee – On the Oxygen Air-Frame Tube Bladders Against Any Manufacturing Faults. Side Door Inflatable Eyebrow Canopy – Additional Side Mini Porch/Canopy Area with Shelter Against the Elements. Telescopic Roof Tensioning Pole – A Robust Steel Pole to Further Support & Uphold the Awning, Which Slots in to the Roof. Sewn-In PE Groundsheet – To Add Convenience When Pitching, Preventing Water Ingression & Helping Keep Bugs Out of Your Living Area. Phoenix Mesh Front & Side Door Panel – Breathable Assisted-Healing Mesh Flyscreens for Enhanced Airflow, Which Self-Repairs ‘Snag’ Damage. Two Rear Cowl Access Doors – To Allow Access to the Vehicle Without Traipsing Through the Whole Awning, Featuring Waterproof Zips. Tinted Anti-Glare Window Panels – Expansive Windows Offering a Panoramic Vista of Any Surroundings, Whilst Reducing Glare & Increasing Privacy. 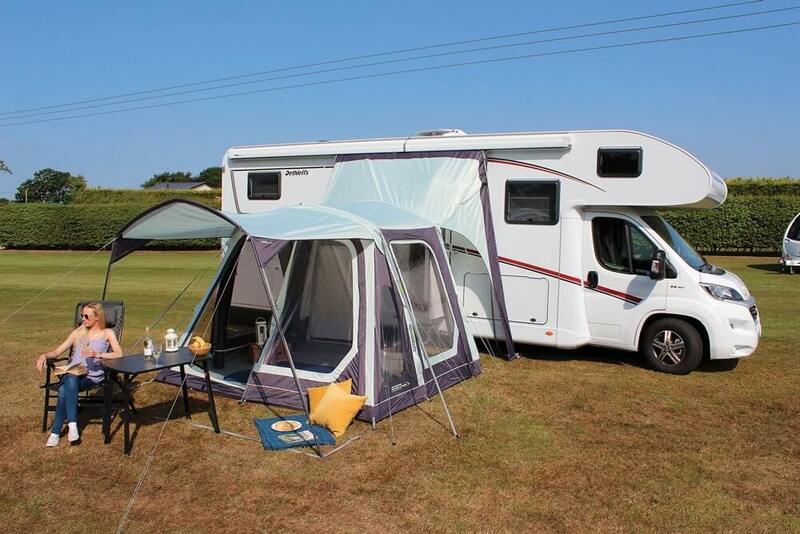 Includes Electrical Hook-Up Point – To Power Electrical Appliances within the Awning. Deep Cowl with Tapered Profile Side – 110cm Deep Cowl Ensuring a Better, Weather-Tight Fit. Large Interconnecting Zip-Back Rear Cowl Door – Allowing Easy Vehicle Access. Cowl Door Ventilation with Zip-Down Draught Covers – Aiding in Maintaining Optimal Air Circulation.